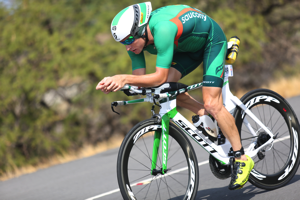 Luke McKenzie was one of the big surprises in Kona 2013. Since then, he hasn’t had another really great result: He validated his Kona slot in Melbourne with a 13th place finish after some helmet strap issues, then finished Roth in 10th place. On the personal side, he and his partner Beth Gerdes became parents to their daughter Wynne who will be just over four months old when daddy has to race in Kona. Beth helped me get Luke’s perspective on Kona 2014 for my upcoming Kona Rating Report (pre-order here). Thorsten: How was your season so far? Luke: Honestly I had two very disappointing Iron-distance races. I felt really well prepared for both, but neither panned out as I expected. In Roth, I had to make the decision to “shut it down” in the run and saved my legs. I felt as though I recovered really quickly from Roth. Those are behind me as I head into Kona. I think the proof is there that I’ve been in contention the last three years in Hawaii so it’s definitely a race that suits me and my strengths. I also have the 110% physical and mental focus on Hawaii all year long that I never quite get for other races- which can be both a weakness and an asset. 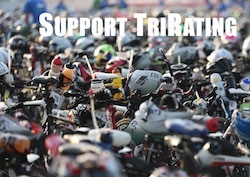 T: How is your preparation different for Kona? L: My preparation for Kona is a bit more consistent each year than my prep is throughout the rest of the year and it’s the one race that I truly get excited to train for each and every day. I base myself in Bend, OR for 6 weeks each summer to really focus in on training and nothing else and I know this sets me up well. I also arrive on the Big Island 3 to 4 weeks ahead of the race, which also seems to be an important key for me. T: From your perspective, what makes the Kona race or course special? L: That’s what excites me personally about Kona. I feel like I thrive in the harsh conditions that the island brings and I actually hope for the toughest, windiest, hottest day possible out there. I train my body and my mind to welcome whatever the day brings and the tougher the better. T: What would be a good result for you this year? L: A great result for me would be Top 5, but realistically I think that after having the race I did last year, I see the potential that I can win it. I think Hawaii is its own beast and hard to compare to other races when it comes to ratings and results. T: Who is the most underrated athlete? L: I’d go with Jan Frodeno and myself of course. On the women’s side, I think Heather Wuertle will do better than her prediction – she seems in form for at least a top 10.